Dive beneath the thick expanse of ice covering the continent of Antarctica, and you'll be amazed at the abundance and variety of colourful marine life that lives in this cold, forbidding environment. Sea snails, starfish, crabs, sponges and many more eke out a meagre existence many hundreds of metres below sea level - far from the inquisitive eyes of the world's scientists and researchers, eager to learn more about them. 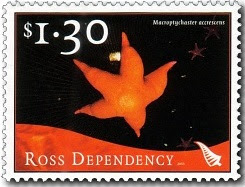 40c - Red Seastar (Odontaster Validus). 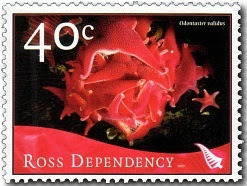 The most abundant of the seastar species, the red seastar lives in the shallow shelf waters of Antarctica and grows up to seven centimetres from centre to arm tips. It's easily identified for the way it rests with its arm tips slightly raised - warning indeed to its prey, which include sea urchins, McMurdo sponges and other seastars. 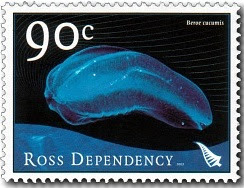 90c - Sea Gooseberry / Comb Jelly (Beroe Cucumis). The comb jelly (also called a ctenophore) is sometimes mistaken for a jellyfish as it floats freely through the ocean. Made up of more than 95 percent water, these oval-shaped creatures have no bones or shells to weigh them down - they simply beat the tiny comb-like plates along their bodies to propel themselves along, and use their tentacles to capture food. $1.30 - Giant Seastar (Macroptychaster Accrescens). The giant seastar lives deep beneath Antarctica's ice and grows up to 26 centimetres in radius (from centre to arm tip). In this low-food environment, the seastar produces non-feeding larvae - instead, they develop on stored yolk to ensure their survival. The larvae grow up with an orange hue, with darker brown bands across the arms and brown markings on the central disc. 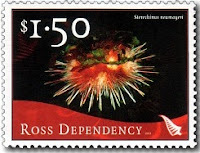 $1.50 - Sea Urchin (Sterechinus Neumayeri). With its spiky exterior, the Antarctic sea urchin makes a spectacular sight on Antarctica's ocean floor, cruising along using its spines and sucker-tipped tube feet. Those pointed spines also play a role in the sea urchin's personal defence system, for it uses them to attach camouflage (bits of shell and debris) to itself - and escape the clutches of its predators. 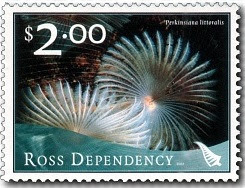 $2.00 - Fan Worm (Perkinsiana Littoralis). Sometimes called the 'featherduster worm', this gorgeous creature grows up to 20 centimetres long and can be found at depths of up to 800 metres. The spectacular tentacular crown is a food-gathering net for the worm's suspension feeding habit - the outspread feathery radioles carry small food particles down to its central mouth. 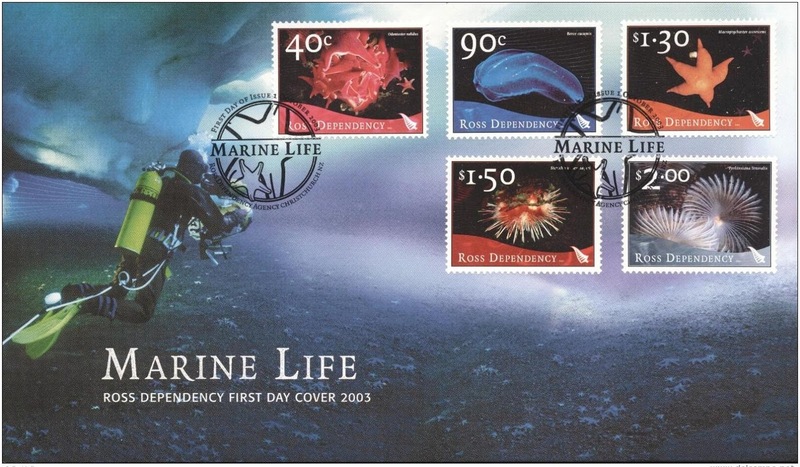 Marine Life - First Day Cover.